Dance Commentary by Heather Desaulniers: "Constants & Variables"
Consider ‘constants’ and ‘variables’ through a mathematical and algebraic lens - terms in an equation, fixed/consistent versus changeable/unknown. 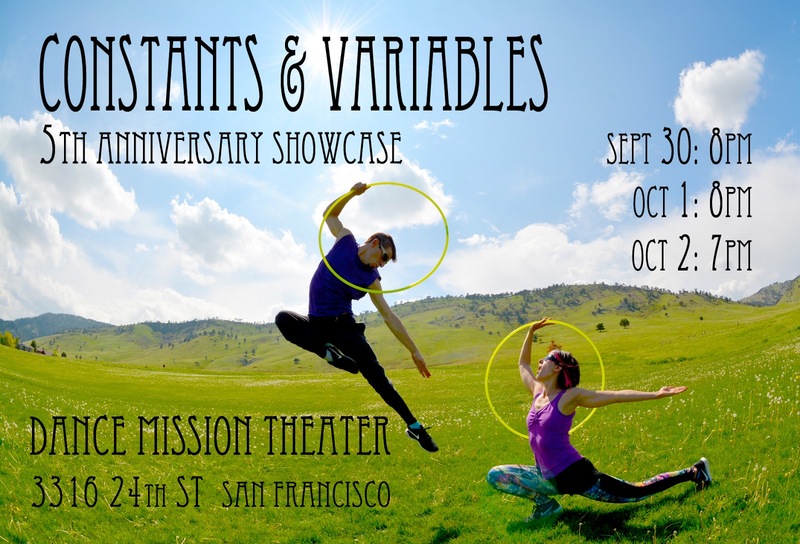 Twisted Oak Dance Theater has chosen this apt title (“Constants & Variables”) for the company’s annual curated program at Dance Mission Theater. Each year, Director Colin Epstein assembles a new performing arts salon, a shared concert with returning mainstay constants and newer variables alike. For the fifth anniversary edition of this program, which ran this past weekend, Epstein invited a cohort of alumni from past years - Mid to West Dance Company, One Thought Theater, Twisted Oak Dance Theater, Ninja Hoops, Heather Arnett and 13th Floor. In addition, ka·nei·see | collective joined Friday’s performance, previewing their full-length work Readymade, which will have its premiere next weekend also at Dance Mission Theater. Opening the program was Mid to West Dance Company’s Faces and People, an ensemble work for six dancers choreographed by Sarah JG Chenoweth, Rebecca Chun and Mo Miner. A joyful expression of fluidity and connectedness overwhelmed the stage from the first entrance to the blackout – bodies moving through space, carving out the space and creating shapes within the space. Whether staccato or legato, in unison or cannoned timing, partnered or individual, each movement flowed deliciously into the next. Hands sliced through the air, upper bodies swung forward in rebounding curves, hips undulated, legs battemented in second position, arms swept like birds’ wings. Lush physicality, phrasal connectivity, forward motion and delightful performances – a beautiful start to 2016’s “Constants & Variables”. Twisted Oak Dance Theater brought Epstein’s Untangled, an interdisciplinary mix of dance, text and scenework set in an abstracted theatrical container. Characters from different realms came together - three muse-like orchestrators, a devilish imp and a human - in a game of control that ultimately became a parable of choice and structure. And peppered throughout the program were three comical interludes by One Thought Theater on the meaning of art, one of which called on the audience for participation. Two apparatus offerings were up next. First, Ninja Interrupta by Ninja Hoops’ Zach Fischer and Marria Grace – a super fun and playful combination of martial arts, acrobatic choreography, juggling, humor and of course, hoops. One might assume that Heather Arnett’s Saving Seats was a solo but it was in fact a quintet, a cast of one dancer (Arnett) and four chairs, one of which was attached to Arnett’s back throughout the entire piece. An innovative approach to the relationship between movement, props and set pieces, Saving Seats found the soloist ‘partnering’ with all of the chairs – I definitely look forward to seeing more of Arnett’s work in the future. 13th Floor closed the 2016 “Constants & Variables” program with The End of the Story, a multi-genre physical theater composition with cleverly tangled plot points and purposeful quirky melodrama. Narratives of interruption, unexpected turns of events and porous portals between life and death were explored through a narrator and two couples. Choreographically, a recurring waltzy sequence acted as a break in the action, injecting some winsome charm. And the group dance at the end was a hilarious physical mash-up; an farcical vaudevillian take on everything from contemporary dance to pas de deux partnering to 1970s jazz pas de boureés.